Let Mrs. Timothy Kilbourne, (nee Clement Woodhull) tell you about the dishes. 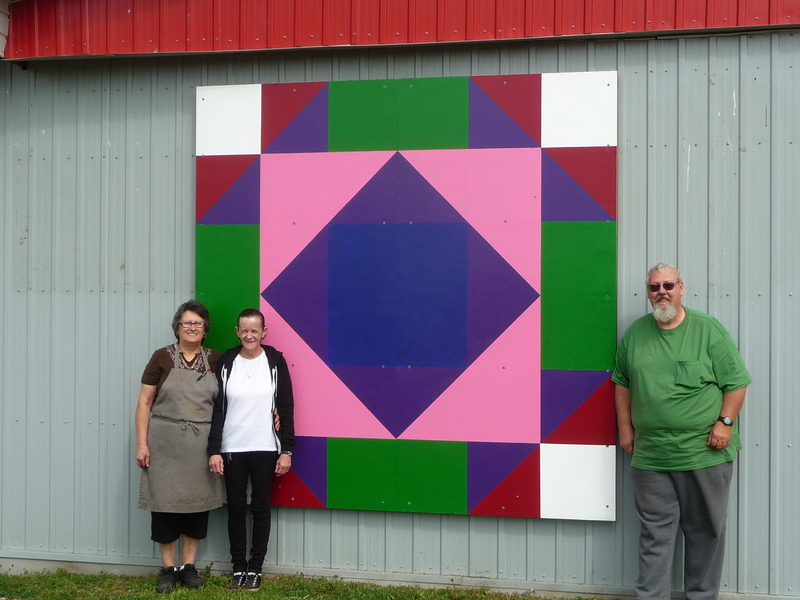 Hilltop Antique owners with Broken Dishes barn quilt. In the summer of 1812 my husband Timothy and his brother Aaron were in the militia serving under Captain Daniel Springer near Detroit. My sister Hannah and I were alone with our 14 children. On May 4, Hannah gave birth to a daughter, Clementine.British soldiers traveling from Burlington Heights westward passed through Delaware. We settlers were obliged to board these troops in our houses and barns. Scuffles broke out. Dishes were broken.These events continued until October 1813, and the defeated General Proctor’s retreat. Four hogs and a sheep were taken from our farm along with our remaining fence rails. The retreating British Indians, starving and desperate for food ransacked our house. Dishes were broken.This was now our life. In July 1814 our hay and oats were taken. August 28 1814 Sgt. Thomas Dowlin of the Oxford militia was in our home buying cattle. A group of American Rangers threw open the door. My little ones were terrified . Sgt Dowlin was taken prisoner. Dishes were broken.In October 1814, General McArthur’s army with the traitor Andrew Westbrook passed through Delaware on their route of destruction. At the farm of my sister Hannah and her husband Aaron , crops and fence rails were taken. In the house , doors were ripped off and floor boards taken up for fuel. Dishes were broken. The office of my father-in-law Joseph Kilbourne, the clerk of the township, was burned, along with the precious documents of our settlement. The family tea set the old man treasured was destroyed. At the end of the war our dishes, were nothing but shards.